On Saturday 16 September 2000 the artists Anna Best, Karen Guthrie, Nina Pope and Simon Poulter launched the Festival Of Lying at Grizedale Theatre in Cumbria. In collaboration with four recent winners from the World's Biggest Liar Competition they investigated the unique mix of truth and received wisdom that consitutes a successful lie.The Festival celebrated and debated lying in all its forms. During the day there were contributions by leading figures from the media, e-commerce, psychology, crop circles and the paranormal, culminating with a panel discussion chaired by writer Jon Ronson. The entire day was webcast live including the 'Little Liars' contest, a local Elvis tribute, and video screenings. In the evening Cumbria's top liars John Graham, Howard Christie, James Mason and Cliff Atkinson performed four specially commissioned lies accompanied by projections mixed live by the artists. 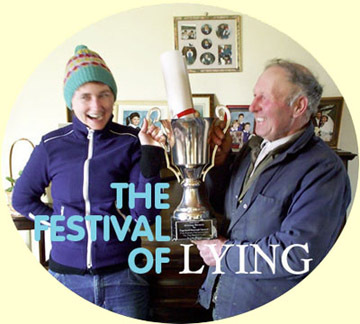 The Festival Of Lying was part of The Grizedale Show and was financially supported by Northern Arts Regional Arts Lottery Programme and the Calouste Gulbenkian Foundation. Writer Neil Chapman has written a text in response to the Festival which you can read here. Video documentation of the event is available by contacting us. You can now use Real Player to watch how the day unfolded. See the festival programme for details and links to video files.